The Social Work with Groups journal is inviting narrative essays of 5 to 9 manuscript pages, about group work practice that facilitates social justice worldwide. Please read the following instructions carefully. One of the earliest group work researchers, Wilbur Newstetter, composed what has been referred to as the first real definition of group work. He spoke to a dual vision, later referred to by William Schwartz as a focus on the “near things of individual need and the far things of social reform,” an emphasis that is as relevant today as it was then. Group work can be an effective context for facilitating empowerment at individual and systemic levels. This special issue of Social Work with Groups will focus on the social reform part of the equation by organizing a collection of narrative essays about practice that supports social reform. Your social justice story can reflect group work practice in the context of (1) a larger social movement or (2) a more localized effort that impacts individuals in communities, workplaces or schools, for example. Another way to view social justice practice is through group work efforts to “make waves,” that may be reflected by large crashing waves, or smaller more gentle waves that better people’s well being. 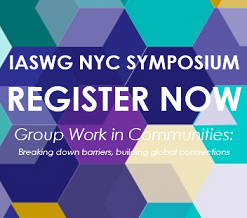 Submissions may reflect the integration of group work and community organization and empowerment practice. A narrative essay is a story written about a personal experience. Writing a narrative essay provides an opportunity to get to know and understand oneself better and to shed light on an experience that may illuminate its meaning for others. One of the best ways to reveal who you are is to tell a story about how you became aware of something, gained a new way of seeing the world, a new insight. Your group work story should illustrate the interaction among group members and between group members and group workers in a way that brings group encounters to life in a compelling way for readers. And, it should highlight what was learned from the experience that might be useful for readers who are practicing, teaching, or researching group work. Submissions may reflect the perspectives and experiences of researchers, educators, field instructors, students, practitioners, agency administrators, or trainers. Or, if you wish, you may tell a story that reflects your role as a group member in any number of contexts (such as, staff or faculty group, club or team, social movement, therapy or recovery group, and so forth) and, then using your group work knowledge, expand on lessons learned. Submissions must conform to Social Work with Groups submission guidelines that appear in the Journal or at Taylor and Francis website/site address: www.tandfonline.com/action/authorSubmission?show=instructions&journalCode=wswg20. However, please note that the length of manuscript for this special issue is being reduced from 15-20 double spaced manuscript pages to 5-9 manuscript pages. Your story should not include citations or references. Please take note that any submission that exceeds 9 double-spaced manuscript pages or that includes citations or references will be returned. Download the Call for Papers Flyer here.